NEW YORK (AP) — Angel Hernandez hit .250 in Game 3 of the AL Division Series. That’s a mediocre batting average for a player and awful replay average for an umpire. Hernandez was overruled on three of four video reviews of his decisions at first base during Boston’s 16-1 rout of the New York Yankees on Monday night. 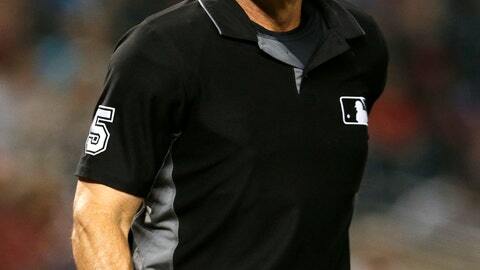 “There were several very close calls at first base tonight, and we are glad that instant replay allowed the umpiring crew to achieve the proper result on all of them,” Major League Baseball said in a statement. The Red Sox, Yankees and fans around the country will see plenty of Hernandez on Tuesday night, when he’s scheduled to work the plate in Game 4. Hernandez’s troubles started in the second inning, when Didi Gregorius bunted with Giancarlo Stanton on first and the umpire ruled Gregorius beat the throw from pitcher Nathan Eovaldi . The call was overturned, giving New York a runner on second with one out. Stanton then singled to put runners at the corners, and Gregorius grounded to Holt. The second baseman made a backhand flip to Bogaerts covering second for a forceout, and Bogaerts threw to first, where Hernandez signaled out for a double play . That led to Hernandez’s third reversal. Former Yankees catcher John Flaherty took issue with Hernandez on the postgame broadcast of the Yankees’ YES Network.